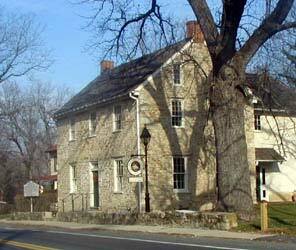 Comptroller Peter Franchot’s discovery that the Town of Brookeville owes $7.2 million to the State of Maryland due to his office’s miscalculation of municipal tax receipts for many years placed the Town in quite a bind, as the municipality of just 134 souls had no idea how it could repay the debt. Today, Brookeville Commission President Katherine Farquhar announced that, after working on the issue with the County and the State, Brookeville will open a casino in historic Brookeville Academy (pictured above), which is owned by the Town, to raise monies to pay off the debt to the State. Franchot praised the decision, stating that he “appreciates the Town’s gratitude to my office for finding the errors” and plans to award the Town the Comptroller’s Medal for its “creative solution” to the Town’s financial difficulties. Members of the County Council had initially expressed concerns regarding the project. But Council President Roger Berliner (D-1) has now announced that the casino will be the first recipient of the microloan program he has advertised on Facebook in anticipation of his 2018 County Executive bid. After initial opposition, Councilmember Tom Hucker (D-5) came on board once the Town agreed to hire MCGEO workers transferred from county liquor stores. “They know as much about gaming as beer, wine and liquor, so this is a great opportunity,” said MCGEO President Gino Renne. Councilmember Hans Riemer (D-AL) also applauded the project, saying that he was happy to learn that Brookeville “is open to serving craft beers” that an official taskforce determined were crucial to revitalizing nightlife in the County. The casino will have a War of 1812 theme, reflecting Brookeville’s role as the “U.S. Capital for a Day” in 1814 during the British occupation of Washington. The building’s exterior will be preserved as the interior is redesigned in a “modern Madisionian” style.